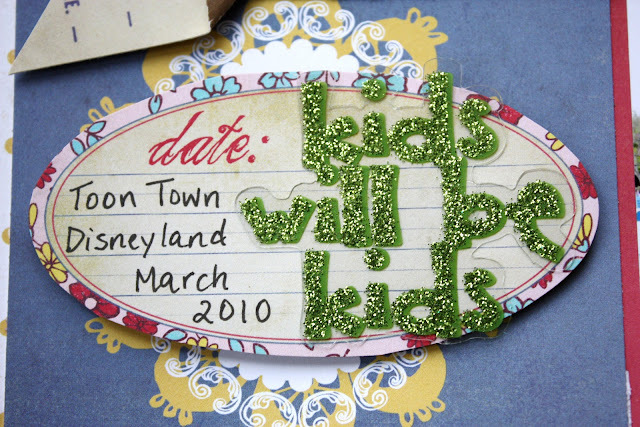 This collection comes with wonderful embellishments, which I used on my two layouts: ribbon, rub-ons, stickers, alphabet, and glitter cut-outs. I thought these fun bright papers were perfect for some photos of Disneyland. Here is BabyOfTheFamily in Toon Town, a trip we made a few years ago…when she was still interested in playing with fake TNT. This flower “glitter cut” serves as my pinwheel centre. I outlined the title with a black marker so it would stand out more. Isn’t this “Glitter Girl” adorable? The next layout is actually about one of my passions in life: community service. But the photo is not me! ha ha ha! It’s the teacher of the preschool on the first day of class. Since we moved into our neighbourhood 12 years ago, I’ve been involved in our community league and a number of projects. Organizing a preschool for our neighbourhood is something that was near and dear to my heart. I am passionate about Education! Love this quote! It’s a rub-on. It’s funny, but I haven’t created with Fancy Pants papers in quite awhile…but I used to use them ALL the time. I think you can relate: Too many papers….too little time! I even felt a bit like a preschooler myself, working with this bright colour palette, cutting and pasting. Ahhhh….to be a child again! Super cute layouts! Love all the fun patterns and colors! 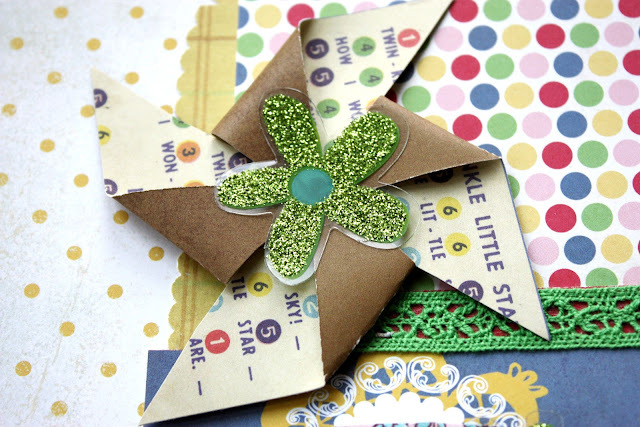 The little glittery flowers on your pinwheels are adorable! Such cute layouts Kelly! 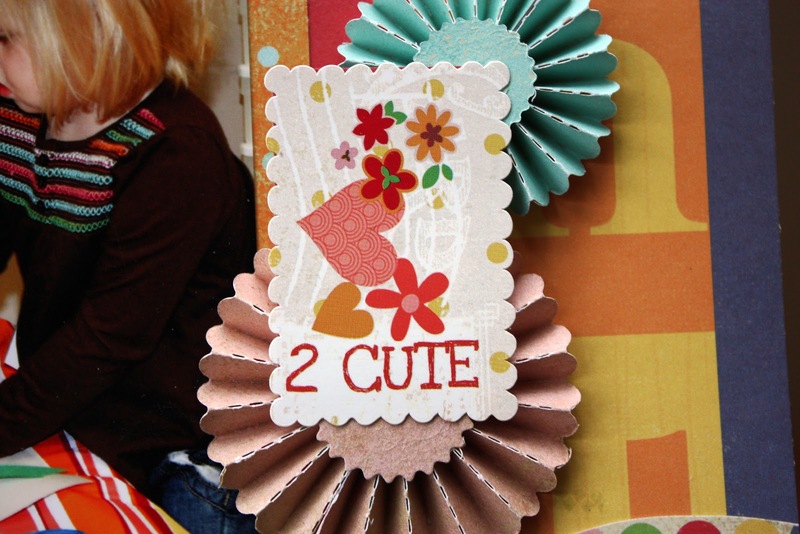 The pinwheels and the rosettes really add a lot of impact. I just love your attention to the details on your layouts Kelly. It showcases the photos so well. Love the bright fun projects!! All the glitter is fantastic!! 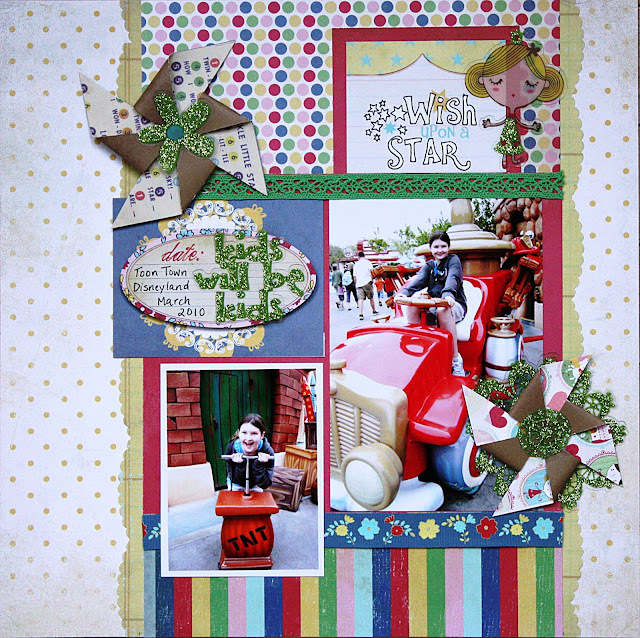 Such amazing layouts, Kelly! I love both of them, and I always like getting to know you a little better through your scrapbook pages! I think all of your photos, little details, journaling, and designs are just wonderful!!!! Fun layouts. Good for you and your community service! Love the rubon and your pinwheels, glitter and rosettes are perfect! Very cool work! Cute photos too! You are a whiz with these colors Kelly!!! Love the details also!!!! Um-um … so many great details! Love looking at your work! 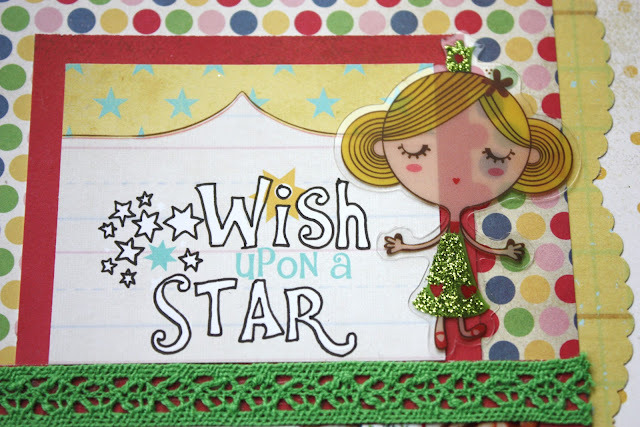 Cute layouts!Love the glittering as well! What cute layouts Kelly!!! And I know exactly what you mean! I would love to have enough time to play with it all!!! These turned out great, Kelly. I really like the design of both. I love when you point out the details and little tips, like outlining titles with a marker. I always learn something new here! I haven’t used FP in a long time either, but I just got The Good Life and am anxious to play. It looks really fun. Wonderfully free and fun pages! And yes…childlike in the best way. Good for you Kelly….about your voluntarism. 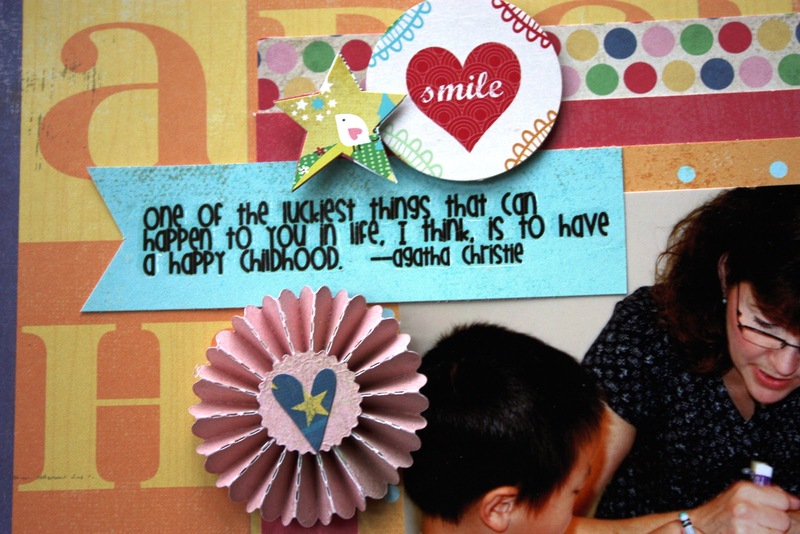 I did a lot of volunteering when my children were little and I was a SAHM. You are one busy lady!!! Big hugs to YOU! you have made it sooo beautiful!! These pages are adorable! Very fun and whimsical too! I’m been totally MIA, I apologize!